Her human name was Donna. She had a husband named Bill, a son named Rob. Donna lived in the desert in a house she and Bill had built when they were young. Her humanity was an integral part of who she was. But it was not the only part, nor even the largest part. 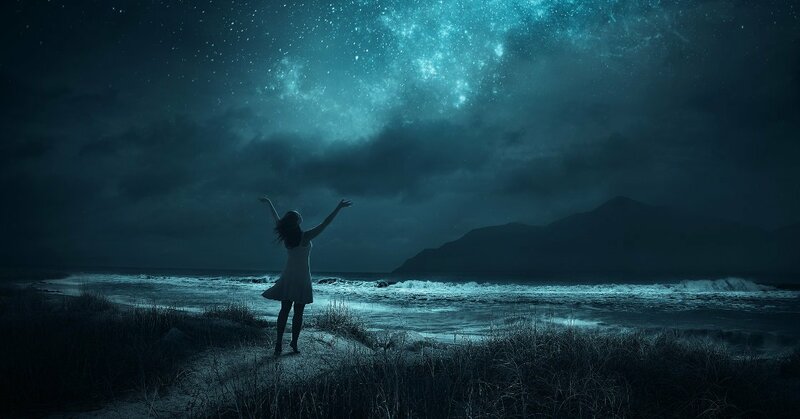 In a realm beyond the stars, beyond even empty space, she had been a queen, was still a queen, for in that place there was no time, so that when she eventually returned it would be as if she’d never left. She had ruled, and continued to rule, with wisdom and strength. But something was missing. Something important. Something necessary. So she’d descended, subjected herself to the internal workings of the cosmos, taken on flesh and blood. She experienced the fullness of humanity, the highs and the lows, the joys and the sorrows. She plumbed the depths of human emotion, divined its arcane secrets. She learned what it was like to live. To breathe. To feel. Sometimes there was pain, but she found that it was always followed by relief. And sometimes there was sadness, but she found that it was always followed by joy. That had been the most important lesson. She’d lived many happy years with her husband, her family and her friends, and she’d loved every one of them. Love sustained her. Guided her. Fulfilled her. It quickly became the source and summit of her human existence. It was what human poets wrote about, what human musicians sang about, what human philosophers dreamed about. It was the one thing that set the species apart from all the other creatures in the universe. The linearity of time ensured that just as her life had begun, so too would it end. She suspected she had a number of good years left, but when it was time for her Earthly pilgrimage to conclude, she would let the sting of death take her, would let that last pang of loss teach her its final lesson. Then she would ascend once more to her incorporeal throne in the stars, and would carry the memory of her humanity with her. It was part of her now, and would be evermore.